THE ROMANTIC MUSE: The Protectors Book 2, The Scientist. Carolyn Wren is thrilled to announce the release of Book 2 in her Romantic Suspense series The Protectors. 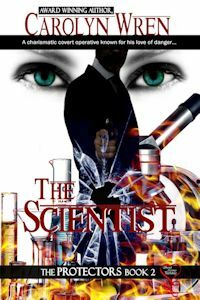 The Scientist follows the adventures of Simon Winters, a popular character from Book 1 Diplomat's Daughter. Available now at Sweet Cravings Publishing, it will be on sale at all good e-book online retailers in a few days time. Stay tuned for links. To celebrate release day, Carolyn would like to offer a giveaway to one commentator. Answer the following question. And its an easy one. Who is your favorite James Bond, and why. Dont forget to leave your email address.